• The effect is completely self-contained – No external gimmicks of any kind are used! • The effect is all done in full view – The chest never leaves the view of the spectator, not even for an instant! 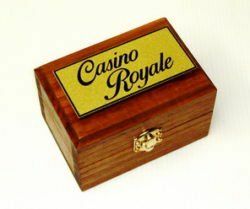 Casino Royale measures approximately 4″ wide x 2.5″ high x 2.7″ deep, (10cms wide, 6.8cms high and 7cms deep) and has been completely handcrafted from natural aged teak wood with a lightly distressed oil finish. 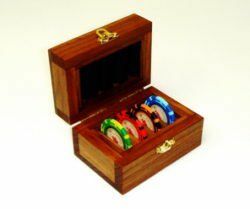 The chest also comes complete with the high quality poker chips and is finally adorned with a beautiful brass engraved plaque.